Absolute Tai Chi (an all around excellent website–look through it!) offers a list of movement names in both English and Chinese. I’ve also transcribed a list from Master Zhu’s instructional videos (which are in Chinese with English subtitles). Master Tsao also has an instructional video, too, which would be in English, with good (and sensible!) translations. All of his videos are good and well worth the moderate cost. The immediate challenge is to figure out which name goes with which movement. The one Jesse Tsao demonstrates in the picture above is Butterfly Drinks Water. 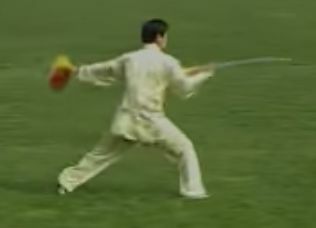 Referring to the Absolute Tai Chi list, Part I ends with the snap of the right blade, which is demonstrated in Master Gohring’s Video 6. Lone Swallow Leaves the Flock is the fajin. What we call the Monkey Hop, and Master Zhu calls Arranging Flowers, on the Absolute Tai Chi list is left and right Stab and Flowers. Honestly, why not just use the Chinese? Cha Hua. Short and easy. And correct! After the second set of Cha Hua, the move with the crossed swords is Subdue the Tiger, Fu Hu in Chinese. Zhong Kui Wields His Sword is the 180-turn with fajin right before the series of double chops (above). This is the end of Part II. To be continued!